Self-lubricating Bearing Defination - CSB Sliding Bearings India Pvt. Ltd.
Oilless refers to lubricant free or only minimum lubricant needed. Our research aims to ensure excellent performance of bushings under different working conditions, and prolong its service life as much as possible. 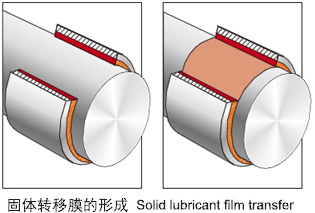 Basic operating principle of self-lubricating bearing: At the initial stage, the transfered solid lubricant on bearing surface generates a lubircating film becasue of the friction between the bearing inner surface and the shaft, to achieve the aim of self lubrication. The solid lubricating film separates direct contact between workpieces, protecting wearing parts and prolonging the service life of bearings and workpieces.